Strawberry season + seven and a half pounds of rhubarb from the back garden + long weekend = first canning of 2011! Result? Six tins of pie filling, eight jars of jam and six jars of rhubarb chutney (Victoria sauce). Plus a bit of leftover rhubarb for stewing. For those concerned about how much time that might take? Two hours or so. Not a big deal at all early in the morning before it gets too warm in the kitchen. A couple of years ago, I posted some canning tips which are worth a read over if you are new to canning this year – otherwise proceed to the recipes we used for this weekend’s food storage project. Combine strawberries, rhubarb, lemon juice and pectin in a large saucepot. Add sugar, stirring until dissolved. Return to a rolling boil. Boil hard 1 minute, stirring constantly. Ladle hot jam into hot jars, leaving 1/4 inch headspace. Process 10 minutes in water bath. Strawberry-Rhubarb Pie Filling – We used the Bernadin Recipe as written on the website as it doesn’t have a high sugar content. Combine rhubarb, raisins, onion, sugar and vinegar in a large sauce pot. Cook until thick, about 25 minutes. As mixture thickens, stir frequently to prevent sticking. Add spices; cook 5 minutes longer. Pour hot into hot jars, leaving 1/4 inch head space. Process 15 minutes in boiling water bath. 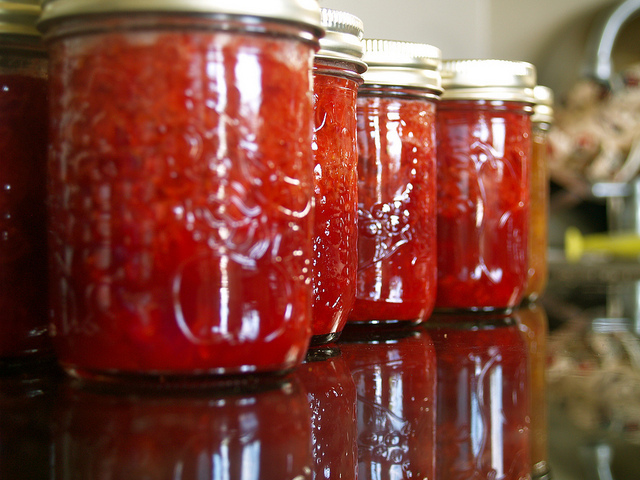 Next up for canning will be raspberries and cherries – both coming on the market as we speak. I’m thinking cherry salsa and stewed rhubarb and raspberries will be on the next round of canning whenever there’s enough cheap product out there for putting up.